Can you discuss the importance of movement in your work? 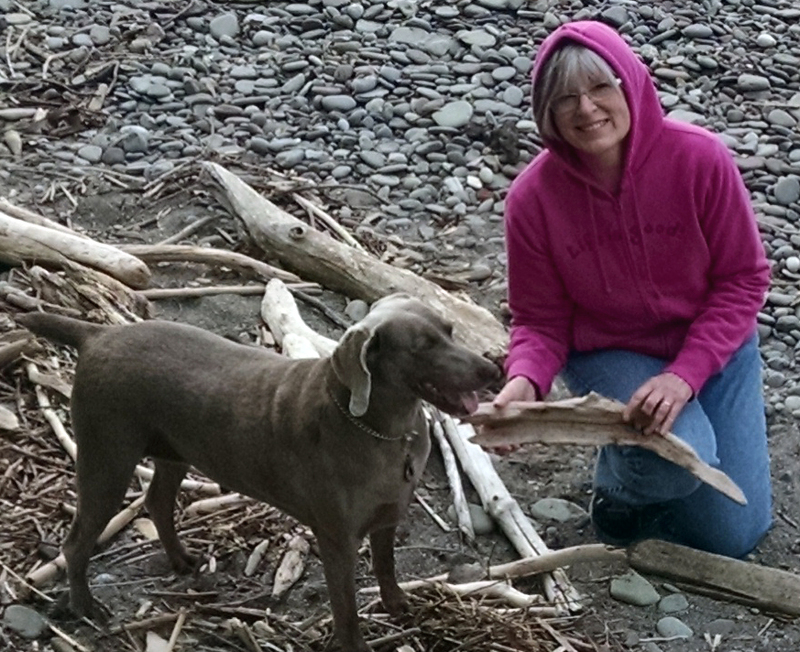 When I collect a piece driftwood that I’ll use for my work, I find myself imagining the journey that brought that piece to that shoreline or riverbank. 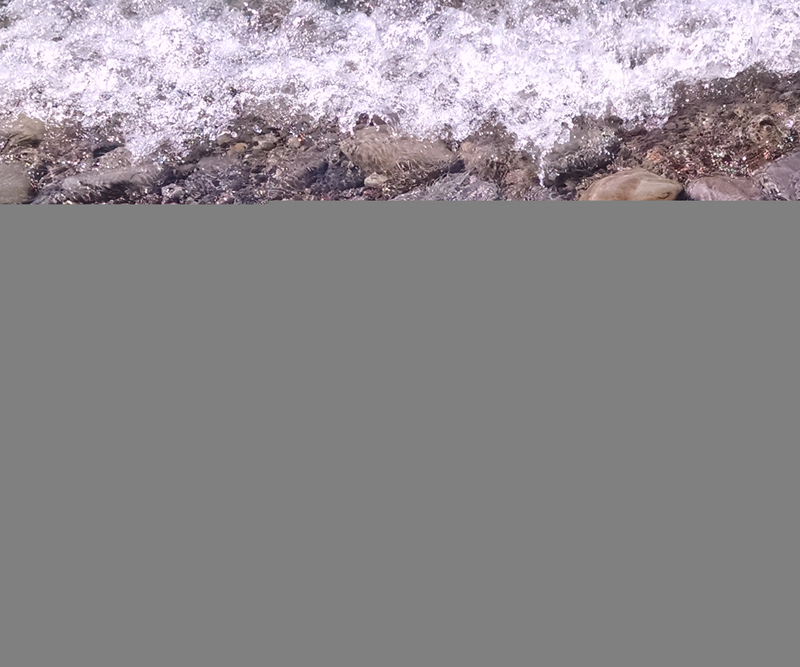 I see it cascading down falls and through rushing currents, crashing against the shoreline if brought in by a storm, or bobbing gently along in quiet waters and settling into the sand as it came to rest on a calm day. I also look for the bends and turns in the piece that developed as the tree grew, twisting and reaching for the sun. These reflections inspire me to attempt to translate the journey, define and illustrate the movement I see. Please explain two techniques you use? Round reed is the material I most often use in my sculptural pieces. It is the inner core of rattan, a fast growing vine, harvested in Indonesia and South East Asia, then sized and sold by the pound. I work with the smallest sizes appropriate for a piece, often size 0 or 00 mm, because of the flexibility it allows. Ribbed weaving is a technique that is used to make the ‘egg’ or ‘buttocks’ baskets. In earlier days, these baskets were placed on a horse’s withers, in front of a rider, and used to transport eggs and other items. Consisting of two hoops that form the handle and rim, ribs are added to construct a frame. A basic over/under weave is used to fill out the body of the basket. I first started weaving plaited baskets, but soon became fascinated with these ribbed baskets, admiring their lines and the many variations that could be created when making the frame. Although I work with round reed for weavers, rather than the traditional flat material, it is this basic technique that I use in my sculptural work today. When do you go beyond natural fibres and into dyed (Coloured) fibres? For many years, I mixed colours and dyed reed to use in my sculptural baskets. To keep the reed as flexible as possible, I found it best to dye the material in small batches and use it while still wet, rather than dying large lots and re-soaking. Even in airtight containers, the reed could not be stored for long before moulding or drying. It was also difficult to achieve the same color with each dye lot, no matter how precisely I measured. Last year, I began experimenting with acrylic paints and have been very pleased with the results. Although it is time consuming to ‘paint’ a piece because of the texture and position of the weaving against the wood, it allows me to work without rushing, offers a greater range of colour, and produces a more even tone. I modelled the Reproduction Grain Harvesting Basket after an old field basket owned by an antiques dealer friend. 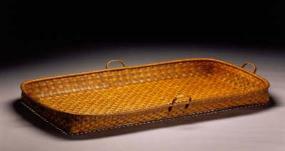 Her understanding was that these large, four-handled baskets were used in New England for winnowing grain. Since the basket was large but light in weight, and the grain would not have been very heavy, I believe that these were probably handled by two people, one on each corner of the basket. I haven’t seen any other antique baskets of this type since, but whenever I am commissioned to make a reproduction, it is to be hung on a wall as a decorative item. 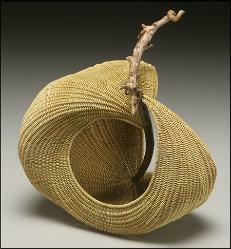 Discuss the importance of looking back at traditional basket making and how this has allowed you to move forward into contemporary basket making? 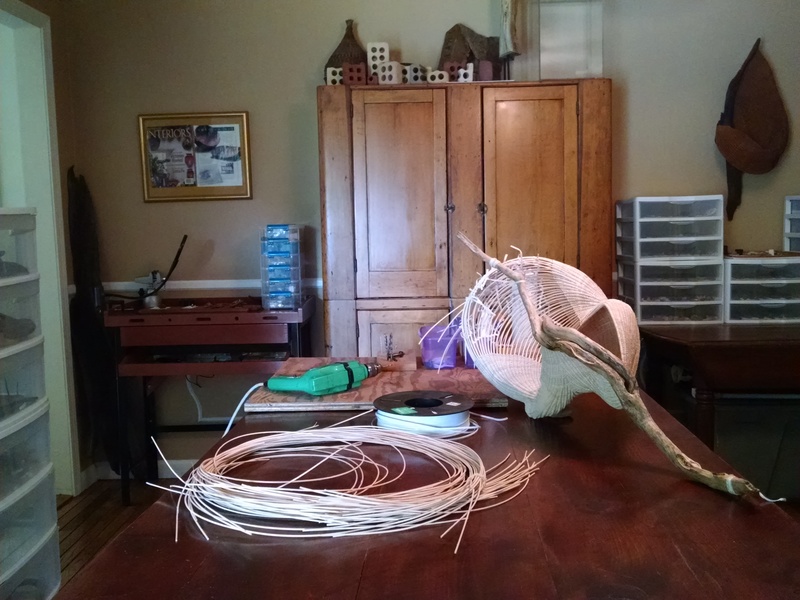 By looking back at traditional basket making, I was able to learn about technique and function. This helped me form a foundation that I was able to work from and enabled me to experiment with new ideas. I would not be able to make my sculptural baskets today if I hadn’t studied the traditional methods and forms of ribbed basketry. Expand on how you gravitate to the disorder of nature for your inspiration? Disorder in nature can appear as order, in the form of patterns, and it is this impression of order that inspires me. 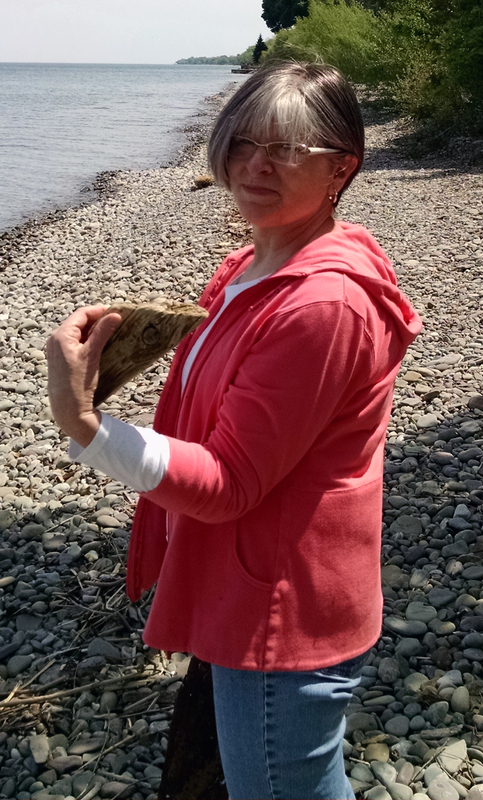 I am often out walking the shoreline of Lake Ontario in good weather, and sometimes in bad. There, the lapping waves against the beach, the pebble mosaics left in the sand by retreating waves, a fossil imprint of plant material in a stone, and the curve in a piece of driftwood are all evidence of order arising from disorder. These examples of pattern and rhythm, two elements fundamental to weaving, intrigue and motivate me. How has your location of the Hudson River, the Niagara River, and Lake Ontario become so influential in your work? Growing up in the Hudson Valley, the River was a focal point. 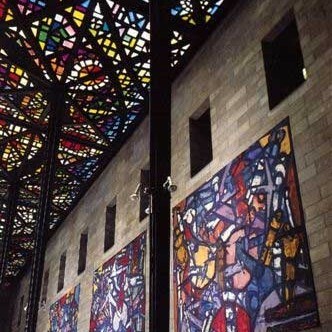 I was always aware of my orientation to it, always unconsciously searching for a glimpse of it as I travelled locally. Its tides are dramatic and I could watch long sections of shoreline reappear in an afternoon, after having been covered by high tide that morning. I’d watch the nun cans slowly shift their directions, pointing from north to south, then back again. I remember standing at the back end of the ferry that carried my family from Newburgh to Beacon, when I was very young, mesmerised by the churning waters in its wake. I also remember being sorely disappointed at my first siting of another river thinking, that perhaps it had been mislabelled, as it couldn’t possibly be a ‘river’. I’d believed all rivers were as wide and majestic as the Hudson. This beautiful and vibrant waterway was alive for me, imprinting images, sights, sounds and sensations that are fundamental to my work. Today, I am very fortunate to have the great Lake Ontario in my back yard. 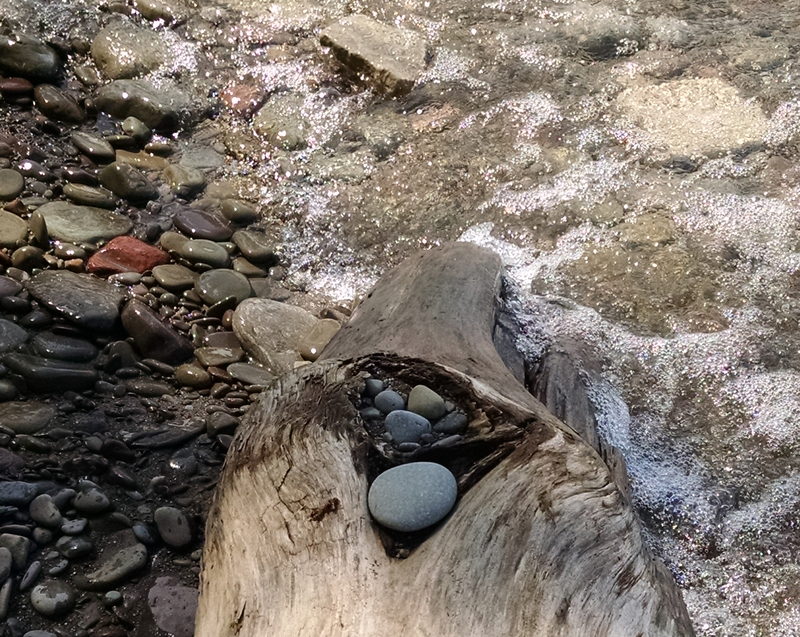 The driftwood I find here has likely travelled down the Niagara River and tumbled through the falls. Walking the ‘beach’ is always interesting, as often huge, ocean-like waves change the shoreline from one day to the next. For me, this means new treasures arriving often. The brighter colours and increasing curves of my recent pieces are a result of the influence of this impressive body of water with its vast size, frequent changes and deep aqua hue. Discuss the materials use in ‘Lunar Lift’? Lunar Lift was made using driftwood found along the Hudson River, and dyed round reed. 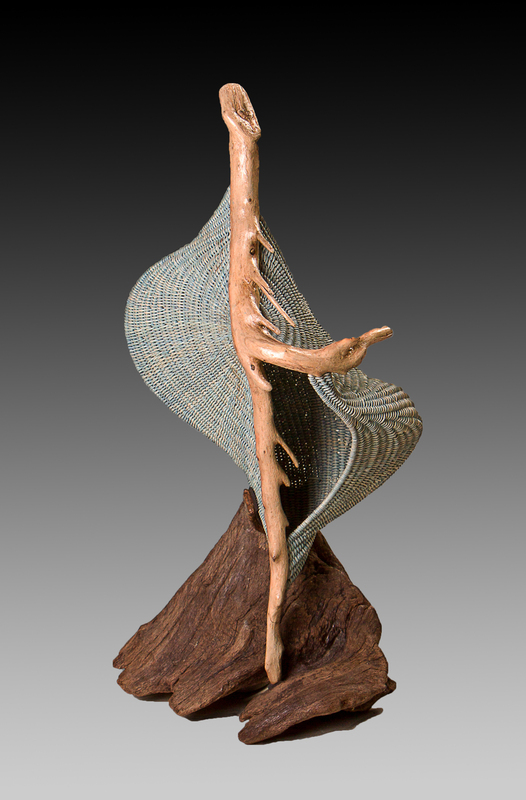 This piece is a little different from most of my pieces as the driftwood was used as a component in a more geometric composition, rather than an attempt to portray a sense of movement. Can you explain the best way to care for baskets? My traditional baskets have a linseed oil finish and can be taken outside, or put in the tub, and gently sprayed with lukewarm water once a year or so. A light dusting with a cloth or feather duster can be done whenever necessary. My sculptural baskets can also be dusted using a feather duster. Your baskets are beautifully photographs can you expand on this? Thank you. I always try to find experienced product photographers in the areas I live in to photograph my work. While I determine the position of each piece, the photographer is responsible for the difficult job of lighting them. How did your Driftwood jewellery evolve? The driftwood jewelry is something that I started making just this past year. I’ve always collected driftwood and, having moved to this location along Lake Ontario, I find many breathtaking pieces of wood, rusted metal and beach stone that are not large enough to use for woven sculpture. I began making tiny compositions using these finds and realized they could be worn as jewelry. I have a lot of fun creating these small sculptures and I enjoy bringing part of the natural world indoors with me when I wear one. 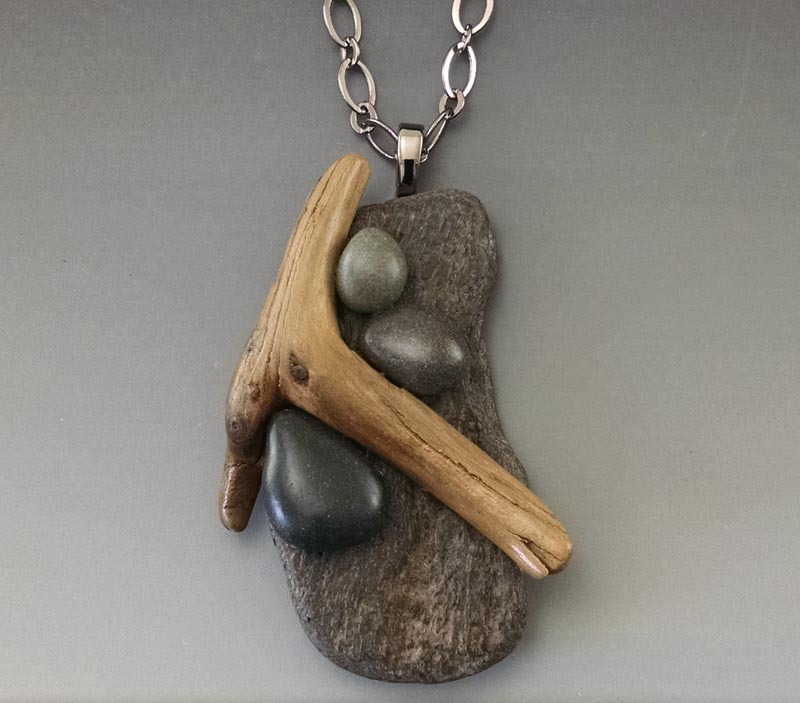 ‘Driftwood necklace with Beach Stone #25’ discuss the Eco Art aspect of this piece. For me, the Eco Art aspect of this piece, and most of my work, is my attempt to describe the natural world and our engagement with it. This piece represents the essence of a walk along the shoreline, as it would not be unusual to find these small pieces of driftwood and beach stone nestled together in the sand, just as I have arranged them in this pendant, the combined force of wind and water having been the artist. How and when did you find your own style? I found my style of combining driftwood and free form sculptural weaving years ago, when I first applied the ribbed weaving technique to a small piece of driftwood I had sitting on a shelf in my home. I’d been making Appalachian Egg baskets for about a year and had seen some ribbed baskets using antlers as handles. I thought it would be interesting to see what I could do with the driftwood that I loved. At that time, I used small pieces and designed them to hang on a wall. The larger, free standing pieces developed as I continued to experiment. Discuss your sculptured basket ‘In Flight’ and how you have developed the stands for many of your sculptured baskets? ‘In Flight’ is one of my favorite pieces. 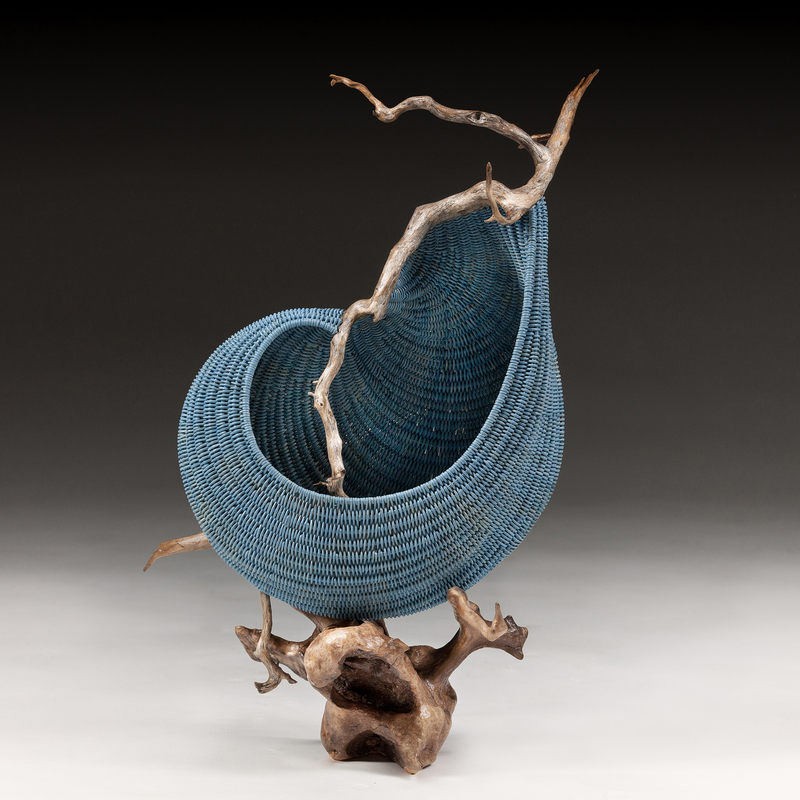 Its orientation and the simple, straightforward lines of both the weaving and the driftwood piece suggest, to me, a feeling of free-spirited soaring. The stand for it was made by a talented welder. While I can describe how I’d like a piece positioned, it is a difficult job to properly balance it and manufacture a metal stand. I’m not always able to find welders to do this and I’ve recently started constructing stands myself, using found metal pieces, stone and driftwood. These new stands have become extensions of the sculptures themselves. I’m truly enjoying the challenge of creating not only a balanced support for a piece, but also one that will showcase it in a way that is reminiscent of the shoreline and my original vision for the sculpture. How important is it for you to focus on a single body of work? As the weaving material I use in my sculptures is small, each piece is very time consuming, most taking months to complete. Because of this constraint, I believe it is important to concentrate on and continue to develop this body of work.